NEW DELHI, India (CNN) -- The alleged gunman captured alive during last year's Mumbai terror attacks told an Indian court Wednesday that he was ready to face execution. 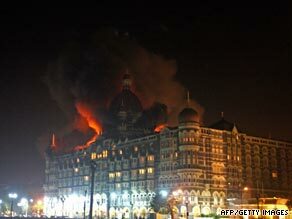 Mumbai's Taj Mahal hotel burns during last November's attack by gunmen. But prosecutors who are trying Mohammed Ajmal Kasab on 86 charges -- including waging war against India -- said they will hold off on recommending a sentence because Kasab has yet to disclose more. Special public prosecutor Ujjwal Nikam said Kasab had downplayed his alleged role in the Mumbai attacks to a minimum. Kasab told the court that he had been under no pressure to plead guilty, according to Nikam. "He (Kasab) wanted to save his skin and that of his colleagues in Pakistan," the prosecutor argued. The case, Nikam said, had "international ramifications" and was not just limited to the lone suspect. Abbas Kazmi, Kasab's defense attorney, said that he had told the court it could accept his client's confessional statement and end the trial if it wanted to. There was no attempt on the defense part to delay the trial, he insisted. Kasab is one of 10 Pakistani nationals who police said unleashed terror on India's financial capital for four days and three nights, beginning November 26. The other suspects were killed during the attacks. Police said the gunmen killed more than 160 people, including many foreigners, as they laid siege on buildings such as the Taj Mahal Palace and Tower and Oberoi-Trident hotels, Mumbai's historic Victoria Terminus train station and the Jewish cultural center, Chabad House. Authorities said Kasab, 21, was trained by Lashkar-e-Tayyiba, a militant group which was banned in Pakistan in 2002 after an attack on India's parliament. The group denied responsibility. Kasab's confession Monday caught prosecutors by surprise. The trial had been underway for two weeks, and the court had heard from 134 of 150 witnesses. Admitting his role in the carnage, Kasab said Zaki-ur-Rehman Lakhvi of Lashkar-e-Tayyiba had been involved in plotting the attacks. Lakhvi, Lashkar-e-Tayyiba's operational chief, was arrested in raids by Pakistani security forces in December last year, shortly after the Mumbai attacks. In a statement issued at the time, the U.S. government said Lakhvi had directed Lashkar-e-Tayyiba's military operations in southeast Asia, Chechnya, Bosnia and Iraq. "Lakhvi instructed LeT associates in 2006 to train operatives for suicide bombings," according to a U.S. government statement. "Prior to that, Lakhvi instructed LeT operatives to conduct attacks in well-populated areas." The United States lists Lashkar-e-Tayyiba as a terrorist group with ties to Osama bin Laden's al Qaeda network.